Extremely elastic and highly reflective, Snow Roof protects your building from both leaks and the sun's rays. It expands and contracts with your roof, and flows into cracks and crevices during application to seal them up. 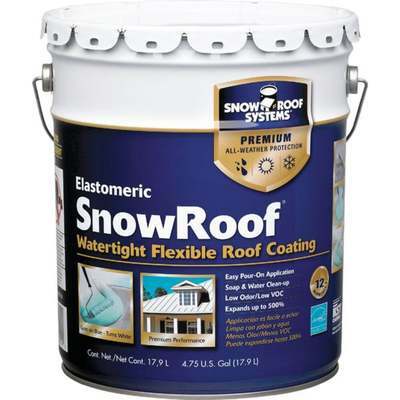 Goes on blue and turns white, premium grade, 100\% elastomeric, water-based, liquid roof coating. Bonds directly to most existing roof systems. Cures to form a tough seamless membrane, which seals and protects the roof. Protects against damaging effects of the sun, wind, snow, rain, and ice. Reflects 90\% of the sun's rays. Dramatically lowers roof and interior temperatures, reducing energy costs. Durable and flexible over wide range of temperatures. Resists mold, mildew, cracking, and peeling. Safe and easy-to-use. Environmentally friendly. For use on a properly drained roof. Soap and water clean up immediately after use. 12 year warranty.